Audio Toolbox™ is optimized for real-time audio processing. audioDeviceReader, audioDeviceWriter, audioPlayerRecorder, dsp.AudioFileReader, and dsp.AudioFileWriter are designed for streaming multichannel audio, and they provide necessary parameters so that you can trade off between throughput and latency. For information on real-time processing and tips on how to optimize your algorithm, see Audio I/O: Buffering, Latency, and Throughput. This tutorial describes how you can implement audio stream processing in MATLAB®. It outlines the workflow for creating a development test bench and provides examples for each stage of the workflow. Build objects to input and output audio from your test bench. Create an audio stream loop that processes your audio frame-by-frame. Add a scope to visualize both the input and output of your audio stream loop. Add a processing algorithm for your audio stream loop. This tutorial also discusses tools for visualizing and tuning your processing algorithm in real time. 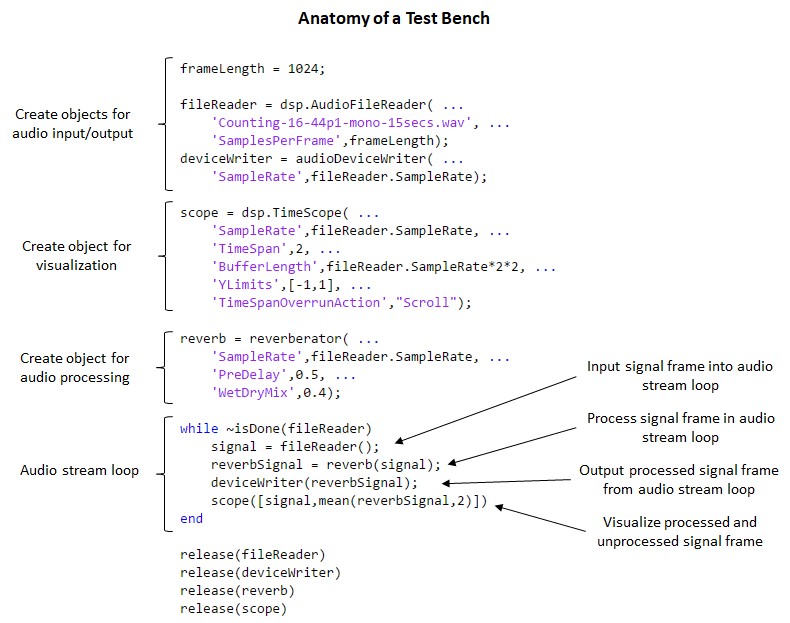 For an overview of the processing loop, consider the completed test bench below. You can recreate this test bench by walking step-by-step through this tutorial. Your audio stream loop can read from a device or a file, and it can write to a device or a file. In this example, you build an audio stream loop that reads audio frame-by-frame from a file and writes audio frame-by-frame to a device. See Quick Start Examples for alternative input/output configurations. Create a dsp.AudioFileReader System object™ and specify a file. To reduce latency, set the SamplesPerFrame property of the dsp.AudioFileReader System object to a small frame size. Next, create an audioDeviceWriter System object and specify its sample rate as the sample rate of your input System object. In this tutorial, the input to the audio stream loop is read from a file. The output is written to a device. To read an audio file frame-by-frame, call your dsp.AudioFileReader within your audio stream loop, and provide no arguments. To write an audio signal frame-by-frame, call your audioDeviceWriter within your audio stream loop with an audio signal as an argument. All System objects have a release function. As a best practice, release your System objects after use, especially if those System objects are communicating with hardware devices such as sound cards. There are several scopes available to the Audio Toolbox user. Two common scopes are the dsp.TimeScope and the dsp.SpectrumAnalyzer. This tutorial uses the dsp.TimeScope System object to visualize the audio signal. The dsp.TimeScope System object displays an audio signal in the time domain. Create the System object. To aid visualization, specify values for the TimeSpan, BufferLength, and YLimits properties. To visualize an audio signal frame-by-frame, call the dsp.TimeScope System object within your audio stream loop with an audio signal as an argument. In this tutorial, you call the reverberator System object to process the signal within your audio stream loop. Create a reverberator System object, and specify the SampleRate property as the sample rate of your input System object. To adjust the reverberation effect, specify values for the PreDelay and WetDryMix properties. To apply the reverberation effect to an audio signal frame-by-frame, call the reverberator System object within your audio stream loop with an audio signal as an argument. The Audio Test Bench – UI-based exercises for audioPlugin classes and most Audio Toolbox System objects. Built-in functions – Functions in Audio Toolbox for visualizing key aspects of your processing algorithms. A custom-built user interface – See Real-Time Parameter Tuning for a tutorial. A MIDI Controller – Many Audio Toolbox System objects include functions that support MIDI controls. You can use the configureMIDI function in the reverberator System object to synchronize your System object properties to MIDI controls. To use MIDI controls with System objects that do not have a configureMIDI function, see MIDI Control Surface Interface. The User Datagram Protocol (UDP) – You can use UDP within MATLAB for connectionless transmission. You can also use UDP to receive or transmit datagrams between environments. Possible applications include using MATLAB tools to tune your audio processing algorithm while playing and visualizing your audio in a third-party environment. For an example application of UDP communication, see Communicate Between a DAW and MATLAB Using UDP. This example uses the audioDeviceReader and audioDeviceWriter System objects to perform real-time I/O stream processing. The processing is limited to adding gain. Click here to open the file. % For simplicity, only add gain. %   acquire one input frame. %   2. Perform your signal processing operation on the input frame. %   frame as an argument. This example uses the audioDeviceReader and dsp.AudioFileWriter System objects to perform real-time I/O stream processing. The processing is limited to adding gain. Click here to open the file. % perform basic signal processing, and write your signal to a file. % Use the sample rate of your input as the sample rate of your output. %    	Note: The file is named 'output.wav' and written to current folder by default. This example uses the dsp.AudioFileReader and audioDeviceWriter System objects to perform real-time I/O stream processing. The processing is limited to adding gain. Click here to open the file. % processed signal using audioDeviceWriter. %   read one input frame.